What makes a “good” software developer? Spend any with software developers and the question of whether a software developer is “good” has invariably arisen. Want to hire a new software developer? Want to promote someone to a lead developer position? Need someone to refactor or redevelop a piece of code? Need someone to work with a different team? You always want a “good” software developer. The challenge is “good” has many different meanings and few can be more specific. What does “good software developer” actually mean? The first skill of a “good” software developer is delivery: writing code quickly with as few bugs as possible. Some software developers are faster than others, some create slightly more bugs than others but the balance should be there. The second skill is product knowledge: knowing where to fix or improve something, the rationale for the current design and impacts of any change – often the hardest parts of software development. This includes the technical ecosystem (what products it integrates or interacts with and how). This list excludes skills like communication and building a network of contacts. They are important but are not software development specific. This list also excludes business knowledge because most software developer “business knowledge” is just product knowledge. Software developers with business knowledge exist and some product owners lack the business knowledge they should have. However, few software developers can step into a non-technical role and perform as well or better than someone hired specifically for the role. 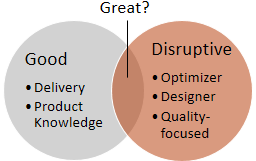 Both delivery and product knowledge provide strong business value. However, does that mean the best software developers are those that have worked on the product the longest? Is “good” synonymous with “experience”? Similarly, with little design up front, regular pivots, increased visibility and pressure to deliver, Agile practices tend to encourage finding the minimal effort to solve a given problem. The constant focus on delivery may dissuade developers from stepping out of their immediate task and learning how to improve themselves, their process and their team. Consequently, there are other skills to consider. For example, optimizers examine a process or product, identify its deficiencies and make concrete improvements. Epitomized by Sam Saffron’s recent post, these developers excel at improving nonfunctional aspects (e.g. performance, scalability, security, usability) or automation (e.g. build process). These are the developers constantly pushing for new tools and libraries because they are better, not just because they are shiny and new. Software developers may also focus on good design. For new products or features, designers focus on how the software works as much as what it does and usually head for the whiteboard first and not an IDE. For established products, designers seek technical debt, fix it and move to the next problem. Software developers may also be quality-focused. Quality-focused developers consider code incomplete until it is both testable and has automated tests. They often espouse the benefits of Test Driven Development (TDD) and code coverage (an imperfect but useful metric) not necessarily for themselves but as easy ways to encourage (or require) others to focus on quality. This list is also hardly conclusive. Some software developers may focus on security, others on user interface design and so on. Optimizers, designers and quality-focused software developers are disruptive and may detract from delivery by focusing too much on improvement. For example, they may spend too much time and effort on switching tools, redesign and over testing. The disruption may extend outside the development team, too. For example, new processes may impact other areas of the business and purchasing new tools may put pressure on budgets. However, these disruptive developers can drive positive change and be a source of innovation. Without them, software developers would still be writing code in assembler using waterfall processes on computers that filled buildings. The first consideration is focusing disruptive software developers on important problems, often difficult for managers not used to software developers driving initiatives from the ground up. Changes must be driven to completion and implementation and not just the initial research and proof of concept. Managers also need to make sure all team members can follow and benefit from the improvements, not just team members driving changes. The second consideration is managing expectations. A disruptive developer brought into the team may expect or be expected to drive change. Setting boundaries and goals beforehand can avoid problems before they occur. However, having the skills mentioned above is not necessarily the best answer to “What makes a good software developer?”. Yes, “good” software developers deliver and amass product knowledge. Some software developers are disruptive and those that drive improvements while delivering may be “great” software developers. However, these are goals. How does a software developer become “good” or “great”? Great software developers strive for continual improvement. If a software developer truly wants to improve, reads widely, experiments and keeps what works then even a “poor” software developer will become “good” or “great” eventually. Continual improvement is often mentioned when discussing Agile development processes but it also applies down to the individual level, such as scripts, key bindings, macros or IDE add-ins. It also applies to the organization level, although this is harder for individual software developers to influence. To look at it another way, great software developers focus on goals and motivations , not just rituals. A good developer may follow Test Driven Development or the SOLID principles but a great developer will know the benefits they bring and when to bend the rules. This is also why great developers learn new languages quickly and apply concepts from one in others. That said, choosing a great developer is not always the best choice for every role or task. Great developers expect more from an organization. This is not just a higher salary and benefits. They expect to make more of an impact but not every organization can provide or allow that. The key is to match the software developer to the task, not just find a “good” or even “great” software developer. This requires understanding what the team needs and how developers improve or lose their edge over time, which requires “good” management. However, that is a whole other blog post.